Have you have ever wondered if you should take your dog to an animal psychiatrist or behaviorist because she snaps at imaginary flies, chases shadows, or has an overly strong prey drive? When your dog is in his crate, does he demolish his blankets so thoroughly that you are considering hiring him out as a document shredder? Does your dog frantically try to escape from your yard or home and resist capture? Is he aggressive, overreactive or overly sensitive to noise? Does he get hysterical during thunder storms? Hump everything in sight? Or suffer from a seizure disorder? Has any illness or change in behavior occurred within days to weeks after a rabies vaccination? For example, your otherwise bold and playful puppy developed irrational fears days after his vet visit. Have you worked on treating a stubborn, chronic condition such as a goopy ear or constant itching for months and finally have resolution only to have it flare up even worse after a rabies vaccine? Your lovely, sweet dog had an unprovoked attack by another dog at the dog park. Other than skin wounds, your dog seems to be alright. Except now she is acting out in an aggressive manner that she’s never exhibited before. Post trauma? Possibly…..
All of the above behaviors and symptoms could be part of the rabies miasm, acquired from a rabies vaccine or even the bite of another vaccinated animal. 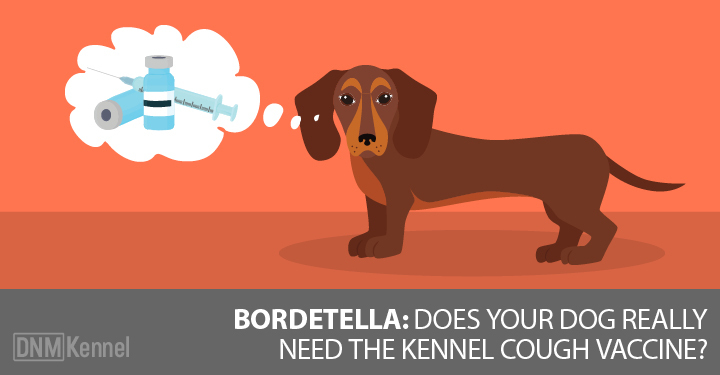 What about the unvaccinated puppy who is overly timid, overly aggressive, or hyperactive. She could also be suffering from inherited rabies miasm. Other symptoms of the rabies miasm include any obsessive-compulsive behavior, difficulty swallowing, excessive gulping, drooling or sneezing, fear or obsessive desire for water or shiny objects, excessive vocalization, overreaction to normal stimuli, or tremors: anything that’s above and beyond what we would ex.pect as normal behavior. What’s similar in the animals affected at the emotional level is the lack of impulse control and the often extreme, erratic and obsessive nature of the behaviors. One material explanation for all of these symptoms and behaviors is the strong evidence that the rabies vaccine can actually cause a low grade inflammation in the brain. What is the rabies miasm? To answer this question, we have to go back to the teachings of Samuel Hahnemann, the Father of Homeopathy. He coined the term miasm which he called taint or noxious influence. Miasms are deeply rooted, multifaceted mistunements of the life force of the organism that are complex, follow a particular pattern and can be manifested in numerous symptoms. In Hahnemann’s exhaustive studies of chronic disease, he realized that there were three major miasms: psora (itch diathesis), sycosis (gonorrhea, or disorders of excess) and syphilis (disorders of destruction) that were responsible for all chronic disease in mankind. He also recognized that psora, the most important and widespread of the miasms, must be present for the other miasms to take hold of the vital force. Getting back to the rabies miasm, it’s technically not a true miasm. It might best be called a pseudo miasm or we could just call it chronic rabies. To gain a thorough understanding of the rabies miasm, it’s essential to recognize that natural rabies (also known as hydrophobia) is an acute disease, usually with explosive symptoms and a rapid demise of the affected individual. With the rabies miasm, the pattern of symptoms are manifestations of rabies but in a more chronic and insidious form which may persist for years. Sometimes the symptoms may be transient after a rabies vaccination, and will resolve in a few days. Many of us have vivid memories of Old Yeller or Cujo in our mind when we think of rabies. Or crazed people tied to trees. Certainly rabies is one of the most feared diseases and is still responsible for unspeakable mortality worldwide. So we should be thankful we have rabies vaccines to protect ourselves and our animals, right? But what is the cost to our animals? Because we are so afraid of rabies, we over compensate by over vaccinating pets WAY above and beyond reason and science, to the point where countless animals are suffering from derangement of their vital force and immune system. What vaccines do energetically is decrease the chance of the animal contracting an acute disease by creating an artificial chronic disease. This condition was coined vaccinosis by Burnett in the 1800’s. Thus vaccination can induce a chronic form of rabies with a myriad of symptoms that are very similar in nature to those occurring in the acute natural disease. If the animal is healthy, it will mount an appropriate immune response from the vaccine and may not exhibit any noticeable ill effects. However, if the animal is already mistuned with chronic disease, then there’s a very good chance it will suffer a flare-up of symptoms after vaccination. Whether the vaccine is a killed or modified version of the original disease, it still has the energy of the disease (as well as all the toxins, heavy metals, contaminants, etc. present in the innocuous looking pink stuff). Alternately, you can take an animal that is actually healthy and, after assaulting it year after year with vaccines, you can certainly make it ill. In many cases, even one vaccine can induce vaccinosis in susceptible individuals. 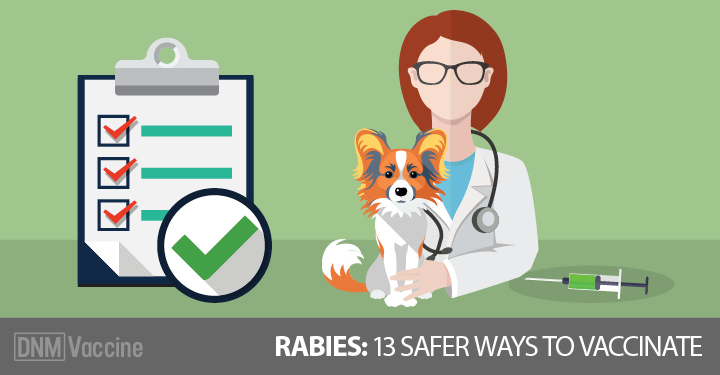 If your dog appears to have symptoms of chronic rabies or the rabies miasm, it’s essential to seek treatment with a knowledgeable homeopathic veterinarian. This miasm can be extremely complex and deep and it takes very careful prescribing with well chosen remedies to bring about a curative response. To find remedies that are suitable to treat animals affected with the rabies miasm, we look at the rubric hydrophobia and all the symptoms associated with it, and carefully look at the symptoms the animal is exhibiting. Gestures, picks at bed clothes. than any other remedy (Hering). The sight or sound of running water or pouring water aggra.vates all complaints. Below are a few cases of chronic rabies that I have worked with. Again, the rabies miasm is very complicated and can really take hold of the vital force and is difficult, if not impossible, at times to eradicate. It can take months and often several remedies in sequence to ameliorate symptoms. It’s possible that many of these animals are incurable. Rolo, a two year old Cairn Terrier, with “epilepsy” was surren.dered to a shelter. He was taken off his seizure medication and placed in a home. When I was asked to evaluate Rolo, he present.ed with a much more unusual set of symptoms. He didn’t interact with his new family because he was too busy obsessively chasing and barking at shadows all day long. When he wasn’t engaged in that behavior, he was frantically trying to escape. Rolo’s case was worked up using rubrics such as Hydrophobia, desire to escape and compulsive behavior. The top remedies based on his behavior included Belladonna and Stramonium. Yet there was no response when he was treated. Unfortunately, his owner quickly went back to conventional medicine when the well selected remedies were not curative. A ten year old Toy Poodle developed seizures and died one week after rabies vaccination. A ten year old cat with chronic sinusitis developed lymphoma in its nasal cavity and sinuses within a month after a rabies vaccine. Sam, a six year old Border Collie/Lab cross rescue was some.what timid, but very sweet. He developed itching skin eruptions, ear discharges and formation of grapefruit sized abscesses. Sam responded well initially to Sulphur, and later to Silica – until his guardian updated his rabies vaccine to comply with the local laws. Within a couple of weeks of vaccination, Sam’s ear discharge re.sumed, much worse than before. He developed a persistent fever, inflammation of his joints, loss of appetite and became very dull. He also exhibited episodes of pain and started to become more aggressive and fearful and bit the guardian badly. He would respond to a well indicated remedy initially, but only for a few days. When he was given Lyssin and also treated by a holistic veterinary nutritionist, he started to improve. All of his symptoms resolved, except the chronic left ear dis.charge. Lastly he developed an abscess behind the left ear and ultimately was able to respond well to Silica. He is a happy boy again. BB, a 12 year old Min Pin, was so sickly as a puppy that his guard.ian was told he should be destroyed. He ultimately survived but suffered from chronic gastrointestinal troubles, itching, unthrift.iness and weakness. He developed chronic ear discharges and aggressiveness after rabies vaccination. BB was started on a raw diet and a long sequence of remedies and is finally doing well. He is much calmer except for occasional flare ups of itchiness in his armpits, a lipoma and cataracts. The remedies which helped him along the way included Belladonna, Calcarea carbonica and Lycopodium. Darla was a 12 year old hound cross who suffered severe separa.tion anxiety. The first episode occurred when the guardians went away on vacation and left Darla with their parents. Darla chewed up a door trying to get to the cat who she likes. She whined, paced and barked at night. After a week of this, she chewed through a wooden window sill, pulled out the window and jumped out of a second story window and took off. Darla also had severe thunderstorm anxiety and was very sympathetic toward others. Phosphorus ameliorated her symptoms. It seems that rabies miasm in our companion animals is at epi.demic proportions. 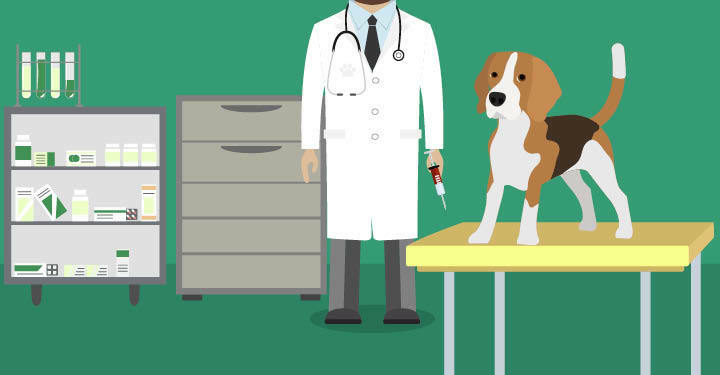 If your dog has had at least two rabies vac.cinations, you might want to look into the option of finding a veterinarian willing to write a letter of exemption for the rabies vaccine, especially if he has any symptoms of chronic disease, no matter how subtle. In all states and most provinces, it is a legal requirement to have your pet up to date on his rabies vaccinations. Luckily vaccine exemptions are becoming more common, so it’s important to know your local laws. Despite the importance of limiting the spread of rabies, it’s both dangerous and unnecessary to sicken our animals with repeated vaccinations when we know that two rabies vaccinations will most likely be protective for the life of the animal. Hopefully, studies such as the Rabies Challenge Fund Study will be taken seriously enough to institute change in how we vaccinate against rabies. I would like to thank Dr. Richard Pitcairn for his insightful teaching and his contribution to this article. Ronna Kabler graduated from Tufts University School of Veteri.nary Medicine. Over the years, Dr. Kabler became increasingly dis.enchanted with conventional veterinary medicine. After her own dog, Genevieve, developed a chronic, painful illness that resolved with homeopathic treatment, Dr. Kabler made the decision to leave conventional medicine. 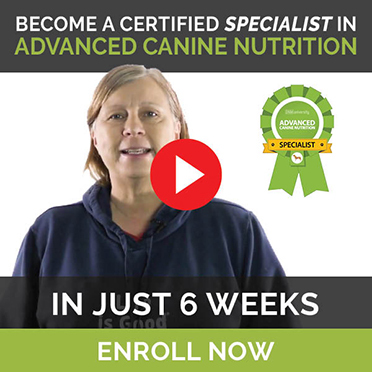 She completed Dr Pitcairn’s Advanced Course in Veterinary Homeopathy and is currently studying to ob.tain her certification in Veterinary Homeopathy.Dr. Kabler started “Waggin’ Tails Veterinary Services, a mobile practice that serves many clients in Massachusetts. She offers a holistic approach to care for her patients which includes Classical Homeopathy, guidance on species appropriate nutrition, titer test.ing in lieu of vaccination and routine laboratory work.